As usual I was whispering to Josh during church; a very bad habit of mine. “Haven’t you noticed that every time missionaries come visit we get all excited about missions,” I whispered in his ear. The couple at the front of the sanctuary were describing to us the conditions in the Russian town they minister in. “Yeah, but I don’t want to go to Russia,” Josh finally whispered back, despite his hatred of my mid-sermon chats. Laughingly, I agreed with him and went back to watching the slide show. The couple had an interesting story about how they ended up in Russia. The husband had spent years praying about Russia and had a heart for the people there. He described how God had actually called him to missions before he even was saved. Then, while they were in the process of raising funds so they could minister in France, an opportunity presented itself for them to go to Russia. He said his wife wasn’t too happy about the switch in local; I would have felt the same. 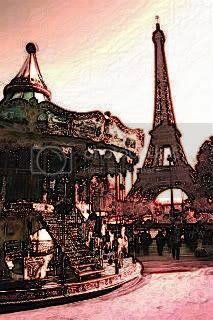 Since I was young I have loved the idea of France: the language, the romance, the sights and the food. I dreamed of spending a year there as a foreign exchange student, which unfortunately didn’t happen. One thing I regret in my life is not overcoming my fears, and going there for a Youth with a Mission Discipleship Training School after I graduated from high school. I want to be a missionary there, someday. I have an inexplicable love for these people, in this country I’ve never visited. When I heard about God’s change in their plans, I could not imagine how I would have felt if God had pulled that switch on me. It made me realize that sometimes, God calls us to a service that is not our heart’s desire. Her choice, like mine, was France. That’s what her plan was, that’s what she wanted. Joking about the arrogance we Americans can have in our prayers and vision of God’s plan, the husband continued their story of their time in Russia. They had been praying for God to send people to their city to plant churches. They assumed the answer to that prayer was American church planters. Years before, the couple had successfully planted churches in Russian, and for the first year of their return they assumed that God had brought them back to plant more churches. Instead, they discovered that God had brought a young man from Siberia to their city to start a church. Their role would not be senior pastors, but rather spiritual mentors. Today they minister to drug addicts and the homeless, they council engaged and young married couples, they support their pastor. The life they had envisioned in Russia was different from what they found God leading them into. Their past experience was not their present reality. This reminded me of the story of Jonah. Jonah did not have a passion to see the people of Nineveh saved. On the contrary, when God told him to go to Nineveh and cry out against their wickedness, Jonah hightailed it in the opposite direction. After a storm at sea, being swallowed by a giant fish, spending three days in the fish’s belly, and being vomited onto dry land, Jonah reluctantly turned his face to Nineveh. Even then, his message to the people of Nineveh was not one of compassion and repentance. Despite his lackluster performance, the people of Nineveh responded. From the greatest to the least, they repented as a city and fasted, crying out to God for grace and mercy. Two different attitudes, yet the same outcome. The missionary couple, when called to a different people and a different role than they’d envisioned, followed the plan of God and made an impact on their city. Today, they have developed a love for these people that is evident in both their speech and actions. God used them to create change in others, and used others to create change in them. Jonah, when called to the people of Nineveh, resisted the plan of God and was then forced into it. Regardless of his attitude, God made an impact on the city, but Jonah remained unchanged. When our plans turn out different from what we’d anticipated, we can choose to reluctantly follow God’s lead or we can embrace what He’s doing and step forward in His reality. Either way, God’s purposes will be realized. But only one way will result in a positive impact within ourselves. Has there been a time in your life where the expectation you had ran contrary to the reality God led you into? How did that impact your faith? Next Post Thank God, life is hard. But how cool would it be if you could write a book in that genre for people who also hate it. Does that make sense? By writing a romance genre book for non-romance genre people, you would be unique and could reach a different audience. I know we put books into categories for a reason, and that it’s easier to sell a book when you can pinpoint an audience, but I say just write and let God figure out the category. Don’t write it saying, “This is a romance.” Write it saying, “This is a story.” Because really, life is full of romance, mystery, drama, and more. You’re a great writer, Jason, and I say just follow God’s prompts and don’t worry about the genre. God has called us to a small urban church where my husband is the pastor. This is not the place I would have chosen but God is here. We see hearts and lives being changed for the gospel. We’re also in a seminary town so we have the wonderful opportunity to mentor young seminarians, many of whom are getting their hands dirty in ministry for the first time. I would never have imagined that we would find ourselves where we are, but it’s clear God is in it. Oh yeah, I have been redirected from my plans many, many times. Sometimes I was fine and other times I was a whiny baby. All I know is, every time I have followed God’s wisdom and plan, it’s turned out great (admittedly, sometimes much later). When I try to make things happen for myself, not so much. Thanks Jason! I appreciate you stopping by everyday. :) It’s nice. I so so so certainly never expected to be where I am. And when I am. Ohhhhhh the “not Ninevah – I want to go to France” thing – then the – “God says thus and so – there – fine – I said it – now leave me alone” – followed by the response, as you put it, “greatest to the least” – then his “YOU HAVE GOT TO BE KIDDDING ME” response – and moping – ohhhhhh – the moping. Poor me – err – I mean poor Jonah. Excited for your first day in the world of blogging, Craig. Heading over to check it out now. Um, YES! And you know what the amazing thing is? HIS expectations were so much BETTER than my reality. Even though it was hard and I would never wish what I went through on anybody else, it led me to a different path in life. I think the hard part is laying down our expectations for His reality. I had hopes and dreams for a different life journey. But, God took my broken dreams and made them into something beautiful. He’s cool like that. When I was young, I also wanted to be a missionary, but the Lord had other plans. Instead we support national ministers and missionaries with monthly offering. Some go and some send. God need us both. Definitely! I attended a church where the pastor’s wife had a huge heart for missions. The pastor always said that one day they would go do missionary work, after they’re done pastoring the church, but for now she has created a wonderful missions department at their church and they are helping so many. Plus, she’s introducing people to missions who might now otherwise have been presented with the opportunity. I’m struggling with this right now. Not really struggling with it, but in the midst of altering my vision of our family’s future for what the Lord has planned for us. I thought for sure we were being called to Portland, OR, but now I’m not so sure. Portland is where I want to be, where I see our family and the place I feel at home. But it’s not been an easy road, and at times, I feel like I may be pushing it. I’m okay with whatever the Lord has planned for us, because I know it’s the best, most wonderful, most prosperous plan. I’m just having a hard time letting go of MY dream for our family, because in my dreams, it was oh-so-beautiful :) Gotta keep in mind that what He has in store is better than any dream I could’ve imagined. This I understand so well! I have been at that place, multiple times. It’s hard to let go of what we want, even when we know God has something better for us. Because what we can visualize seems perfection, and we can’t picture the unknown that He has. Praying for you in this season, Tricia.